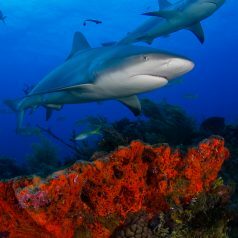 In response to the public outcry that followed the online posting of a gruesome shark finning video last week, the Curacao ministry of Health, Environment, and Nature (GMN) announced that they will bring forward their Ocean Policy Plan. The plan, which was agreed last year, but not yet implemented, includes 10 specific targets for the ocean around Curacao. One of the actions will be to establish a shark sanctuary in the off-shore water of the island, another to ban the import of harpoons.